//pagead2.googlesyndication.com/pagead/js/adsbygoogle.js // This time on Survivor… Mana returns from Tribal sans Caleb and everyone consoles Tai about the hard vote he cast against his friend. He reiterates to the tribe, and to us, that he IS playing for himself and he hopes that he’s earned some trust. The next morning, Hali tries to bond with Debbie and convince her that SHE is more of an asset to Debbie than Tai is, buuut… Around the camp with Brad, Tai, and Seirra, Debbie confirms that if they go to Tribal, Hali is the next to go and everyone agrees. Come on in, guys! Yup! It’s time for a Reward challenge. Up for grabs? First tribe to finish wins an array of coffee items including some cookies! Second tribe to finish wins a thermos of iced coffee. There’s twist to the challenge, though – only two members of each tribe will run the course. The first person will carry a ball on a pole through a series of obstacles adding more length to the pole at the end of each stage. Los Angeles Lakers After successfully carrying the ball through all of the stages, the second person will use the ball to retrieve a key that will unlock a box containing sandbags that must be thrown to knock off nine bamboo targets. Competing for Nuku: JT and Malcolm; for Tavua: Ozzy and Troyzan; for Mana: Tai and Brad. Sooo, Ozzy blows through the obstacle course for Tavua, but drops his ball during the third section giving JT a chance to catch up with him; Ozzy still reaches the end of the balance beam first and Troyzan starts throwing sandbags. Malcolm begins throwing bags shortly after while Tai struggles with the final stage of the obstacle course and soon the boys are both down to three targets. Finally, Tai reaches Brad and he gets to work, but as he races, Malcolm is down to one target and BOOM! Nuku wins the first place reward. Chaussure Asics Pas Cher Troyzan still has two targets and Brad is on FIRE! All of the sudden, Brad is down to two targets, then one; Troyzan is still struggling with his two… And Brad hits his last target winning the iced coffee for Mana. 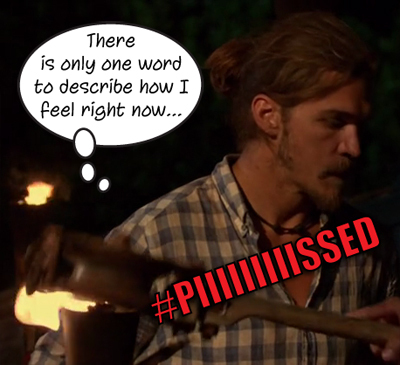 As if Troyzan wasn’t already the odd man out, Cirie lets us know that his days are definitely numbered now… Sooo… Back at the Tavua camp, everyone is pretty bummed about not winning, well, everyone except for Ozzy. As long as they keep losing rewards, the more they rely on him to provide what they need to survive and the more time he has to enjoy the relaxing task of fishing. Also, he catches a good size stingray much to the pleasure of the rest of the tribe. It will give them the energy they need to perform well in the next challenge. Mission accomplished, Ozzy. Mission accomplished. Over at the Nuku camp, everyone is very grateful to JT and Malcom for bringing home the big win. Sandra is especially happy with her tribe; she has good relationships with everyone and she thinks no one has figured out that she’s in control of everything. BUT! She’s wrong. Sandra is all over JT’s radar and he admits it to Malcolm on their way to the beach to go fishing. He wants to target Sandra if they go to Tribal and the vibe he gets from Malcom tells him that he would totally be on board to dethrone the Queen of Survivor… Come on in, guys! Yup! It’s time for the Immunity challenge. Already! We’re only about 13 minutes in and- oh yeah! TWO tribes are going to Tribal Council in this episode! BUT WAIT! There’s more. fjällräven kånken Klassiska Another game-changing twist! Both of the losing tribes will go to Tribal Council, BUT they will only vote out ONE person! Jeff doesn’t tell them the second part of the twist until AFTER the challenge. Because he’s sneaky like that… So! In this challenge, one person will be a caller and the rest of the tribe will be tethered together in pairs. The caller must navigate the pairs to retrieve three bags containing balls; once all the bags are collected they will use the balls on a table maze and must navigate them into three slots in the middle of the table. Running Asics Sneakers Survivors ready? GO! Calling for Mana – Brad; for Nuku – Varner; for Tavua – Cirie. So! Tavua and Nuku are performing very well, but Mana is struggling. Nuku is the first to get all three bags and they race over to the table maze; JT is first to give it a try. Nike Air Max 2017 Dames Tavua isn’t far behind Nuku, they are at the table maze second, then Mana joins a short while later. Ozzy is manning the maze first to Tavua; Seirra starts for Mana. JT is first to sink a ball in the center zone, Ozzy is next, then Malcolm lands a second for Nuku. Sarah lands a second for Tavua and Mana has YET to land a ball in the middle. So, it basically comes down to Varner and Andrea in a race to win the challenge. Both are close, both are almost in the final spots but DOH! Varner loses his ball to a hole in the board and Andra wins the only Immunity for Tavua! After the challenge, and after excusing Tavua, Jeff tells Nuku and Mana that they will, as one group, vote out one member. Of course, everyone is shocked and Aubry knows that this Tribal Council is going to be insane – and she’s absolutely, 100% correct! But first… At Nuku, they feel pretty good because they have the numbers six to five over Mana. Malcolm and JT were thinking Sandra, but with this twist, there are some interesting options. On paper, it’s great because if they stick together as a tribe, someone from Mana will exit the game. Of course, this is Survivor and plans go array all the time. And they do. Everyone is concerned that JT will flip on his new tribe and vote with his old tribe; he says there is NO chance he will do that. Sandra wants to target Seirra, JT wants to target Tai – and he doesn’t think Tai has an Idol, yet, but he’s sneaky… Malcolm asks JT who he thinks Brad will target and he’s pretty confident that he will target Sandra. This puts JT in an interesting position because he COULD vote with his old tribe to get rid of Sandra, but he COULD stick with the majority. He’s still undecided, but he could really change the game with his vote… At Mana, they too understand how complicated this vote will be and they too have an odd woman out in Hali. 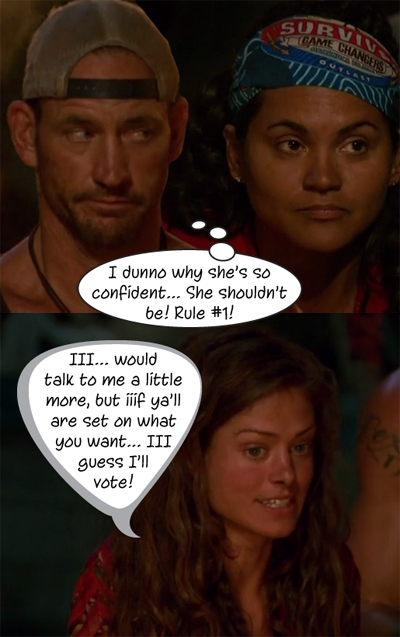 Brad IS concerned that her old tribe members could convince her to vote with them; they really only have a solid four votes at Mana. So, it becomes Brad’s mission to make sure Hali will vote with them and they can be five-strong at the Tribal. They discuss who JT would vote for – Brad is convinced it would be Sandra, definitely over her Malcolm, and everyone agrees, but it is sooo tempting to take a shot at Malcolm because he’s a threat in the long-term for everyone. They all know it’s going to come down to JT and how HE votes. Knowing that he needs an Idol to stay safe… Tai goes out and freaking finds one. Like, how very convienent for Tai and the Mana tribe? 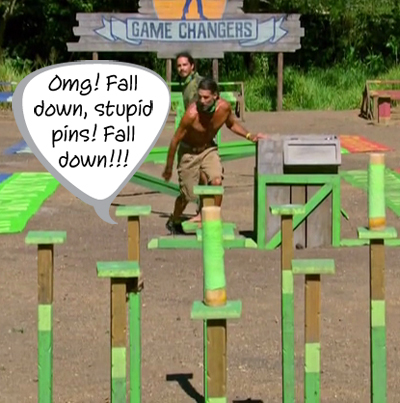 Not to mention Troyzan’s luck last week… I mean… Come on… Really? Anyway… Tai tells the rest of the tribe, he’s the new Hero of Mana, but Sierra is still really nervous about Tribal Council… And awaaay we go! Okay! This is by far the most insane Tribal Council ever. Jeff obviously pries out of the Survivors that things aren’t so crystal clear as to how the votes will go because of Hali and JT’s possible flipping on their current tribemates. Sandra is very clear that her tribe will be voting six-strong, she knows she isn’t going home tonight, and she’s not worried about being such as threat in the game. The whispering among the Mana tribe begins about four minutes into Tribal, but about after about five minutes, JT has had enough and he stands up, walks over to Brad and whispers that Seirra is the target. Hali says “if that’s how we’re gonna be” and walks over to Sandra and tells her that voting Brad is the only way to keep them safe, she promises. And then it’s chaos for about a minute; Hali is huddled with the Nuku tribe saying she will vote Brad with them and the Manas are in their own huddle whispering to each other. Hali returns to them and tells a very scared Sierra that she’s trying to change things – then grins at Jeff, who is speechless. Things settle down – for a few moments while Aubry and Jeff discuss the whoosh of energy that just seemed to swell into the area and they watch in bewilderment that all the whispering is still happening. Ding! Round two begins! But this one doesn’t last near as long. As the group settles down, Sandra says nothing has changed about their vote, interesting things were brought up, but nothing has changed. Nike Air Max Dames Goedkoop Hali looks disappointed then Jeff asks if they are ready to vote – he doesn’t want the party to end if they aren’t ready, but they are totally ready to vote. Well, everyone except Hali. She isn’t ready. Sandra tells her that they can vote. They can vote… And LOL! Hali consents to be ready to vote telling Sandra’s group that they may regret it! LOL I was with a customer during the vote and didn’t catch this bit. Sooo… Hali votes and while she’s voting, Michaela asks Sandra why Hali didn’t just tell them who had the Idol and Sandra is all “girl, nobody got no Idol over there” – cut to Tai in the voting booth! When all the votes are cast, Jeff collects the bin and does the whole “if you wanna play and Idol” speech. Everyone tells Tai to do it so he stands up and asks who wants the Idol – Brad motions for him to give it to Sierra sooo… Sierra is now safe from any votes cast against her sooo… Let’s read those votes and find out how much Nuku will regret not siding with Hali! The vote! Sierra – Sierra – Sierra – Sierra – Sierra – Sierra. None of them count and now we find out who Mana went after… Malcolm. Malcolm. adidas tubular uomo Malcolm… Well… the picture says it all. JT is very upset by this turn of events and Michaela whispers to Varner before they exit the Tribal Council area that she’s thinks JT set them up for that – Varner nods in agreement. Next time on Survivor! JT’s in trouble and Debbie has LOST her mind for some reason. She more piiissed than Malcom! Should be REAL good. Julio Jones Alabama Football Jerseys REAL good. As usual, if you like my blogs, check out more stuff here at Your Reality Recaps. Eric is at it again with the Big Brother action so all you Big Brother Canada fans should be very pleased with all his great content! And before you go… please comment below and let us know what you think! And incase you didn’t know Eric & Jon are covering #BBCAN5. Click the banner below to see all their shows and cast interviews.